Assembly details: Open the car door and place the sun shades on the window frame (metallic part) the magnets will automatically snap on Sun shades for the all windows are tapered from end to end to improve visibility. 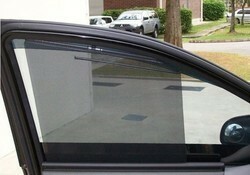 Rolls up or down with the window glass automatically. 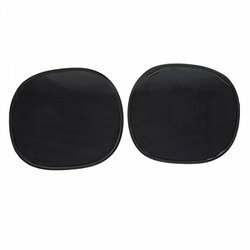 The sunshade hook is attached to the window glasses, then the sunshade fabric rolls up when then the glass is up and the fabric will roll into the aluminium tube automatically when the glass is down . 2. Uni-directional ray transportation: Maofeng polyester fabric have the function to restrict light from outside, from outside people can not see the inside, but according to pinhole imaging theory, people from inside can see outside clearly.This function gives the modern busy people enough privacy spaces while keep the driving safe. 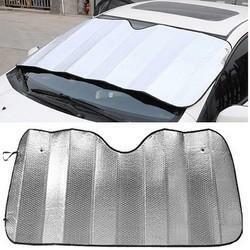 Will fit most windows,full visibility through window,keeps your car cool,protects passengers pets from the sun. 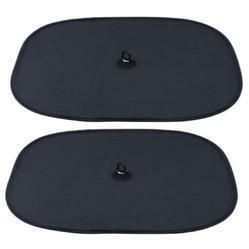 Material: Plastic,Tear resistant material for long lasting service. Front 2 curtain has zip.